Why should you pay us by Direct Debit? Direct Debit is the safest way to pay for reoccurring services like web hosting or advertising campaign. Direct Debit saves you time & effort. Direct Debit requires one-time set-up for ongoing services like web hosting, domain name booking, mailboxes. Direct Debit is trusted. Over 75% of all regular payments in the UK are made by Direct Debit. We use GoCardless which is the UK’s leading Direct Debit provider, processing over £5 billion in payments annually for more than 30,000 organisations big and small. GoCardless notifies our customers in advance of payments being taken, so you’ll never be surprised when money leaves your account. Direct Debit via GoCardless is now our preferred payment method. We think you’ll find it easier to pay through GoCardless, and it helps our business too. A mandate (also known as a “Direct Debit Instruction” or “Direct Debit Request”) is set up on a customer’s bank account when a Direct Debit is authorised for a specific merchant, usually via our online form. An active mandate needs to be in place before any Direct Debit payments can be collected. 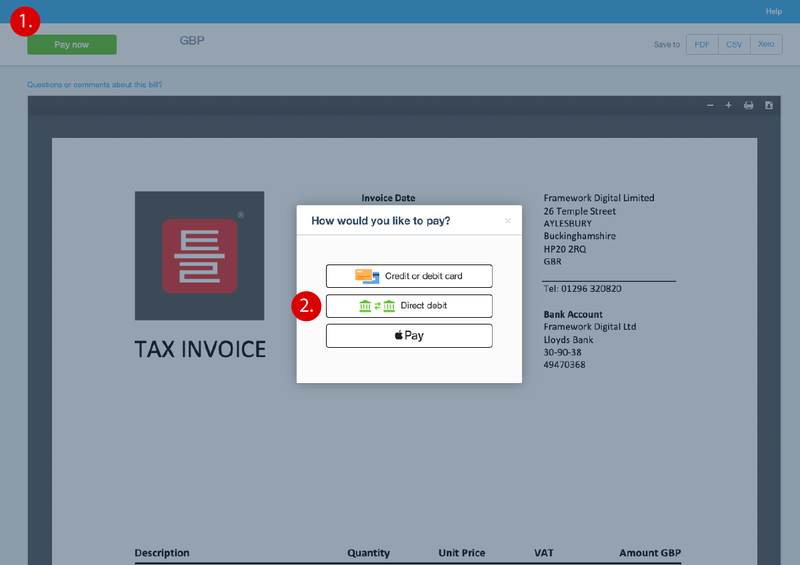 To set up a new Direct Debit now by following this link or by following instructions received by email with any Framework Digital invoice. Follow instructions and complete an DD authorisation form (your bank sort code and account number). The payment for the invoice and the Direct Debit are completed once you submit the completed form. GoCardless is an online Direct Debit provider and as such, they do not offer customers the option to pay via credit or debit cards. You need to provide your bank account name and number and sort code. Your payment will be paid out to us within two working days after the charge date. If you require a refund for a payment you’ve been charged, you would need to get in touch with us. Click the button to set up Direct Debit on our payment system.